Welcome! 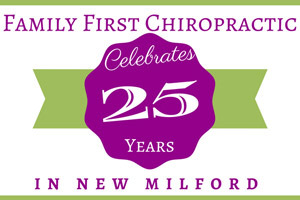 New Milford, Connecticut, is our home, and this is our chiropractic home on the internet. I’m Dr. Arthur Klein and you can find me helping people at Family First Chiropractic and Wellness Center located in New Milford. My wife, Hillary, is the office manager and our resident Food Counselor at Family First Chiropractic and Wellness Center. (Ask me about this if you would like to know more.) If you are looking for a caring and dedicated chiropractor in New Milford; you’ve come to the right place! Back in college, someone suggested I consider becoming a chiropractic doctor. After looking into the chiropractic profession combined with my personal experience – adjustments have helped my sinuses tremendously – I was inspired to become a chiropractic doctor. With over 30 years of experience helping people of all ages with natural, drugless methods, I am still passionate and excited about what I do. We also take care of lots of kids in our office; from baby to teen and everyone in between! Kids respond very quickly to chiropractic care. Whether it is for a particular issue or to prevent sports injuries, chiropractic health care can optimize your child’s performance and give them the competitive edge in whatever sport they play. Please explore our site and get to know us. Use our website to answer your questions and as a great resource for health information for you and your family. Be sure to watch our introductory video and read our current newsletter. Find out why so many of your New Milford neighbors looking for natural solutions, are choosing Family First Chiropractic and Wellness Center for their health care needs. Call our New Milford chiropractic office today to arrange a consultation!